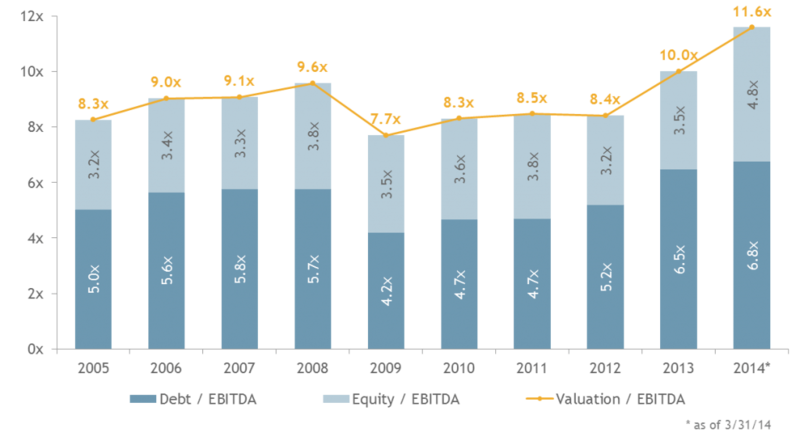 Scott Bulloch, an exit planning professional and advisor, shares his views on why now companies with EBITDA of $1,000,000 or more are attractive to private equity. While there are companies that will meet the minimal thresholds, not all are ready. Is your company or that of your client’s ready for private equity? Is your client’s business ready for Private Equity (PE)? Perhaps it is, perhaps it is not. As an exit planning professional and advisor that devoted much of my career, either to directly advising people on acquiring businesses, or seeking businesses to invest in as partner in a Las Vegas-based private equity firm, I want to share my views on this subject. A consistent theme among Small to Medium Enterprises (SME) is their enthusiasm for their customers, their products, their services, and their role in the community and economy. Around two thirds of these SMEs are owned by Baby Boomers, the generation born immediately after the end of the Second World War. Another consistent, less fortunate, theme is their lack of preparedness for what I call sophisticated capital. Sophisticated capital is an umbrella term referring to any investment vehicle that targets privately owned businesses for inclusion in their portfolio. This includes Venture Capital (VC) funds which usually target early stage businesses, and PE funds which mainly target more mature, cash flow positive businesses. Many VC and PE funds draw outside these lines if there is a strategic reason for doing so. Their capital (the cash they use to invest) is sourced from many and varied places, but important players include High Net Worth Individuals, who are seeking both professional investment management and access to privately owned businesses, which can be very attractive when compared with other investment types (such as bonds, debentures, or publicly traded stock). Some PE funds focus on a very specific set of circumstances, such as buyout funds. 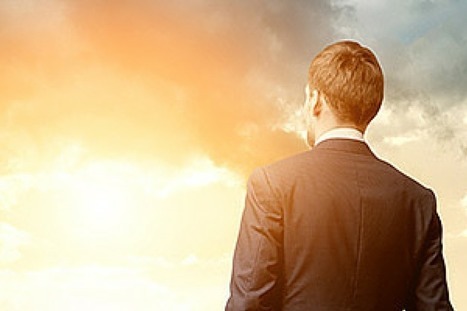 Leveraged buyout funds are famous for their acquire, grow, harvest investment strategy, in that they will seek low-cost debt funding to purchase undervalued or underperforming private businesses, install operational improvements that enhance the value of the business and sell it to a strategic buyer. Theoretically, the difference between the potentially large gain the fund receives at disposition and the relatively small interest the fund pays can lead to substantial value creation. Hence, the phrase: acquire, grow, harvest. One of the most important trends you can observe in the graph below is that there is probably as much cash available to PE funds (the so-called “dry powder”) in the United States as there has ever been. In exit planning for SMEs, timing is a very important factor. The growth in multiples paid by sophisticated capital is at a historical high, so for SMEs that are ready or nearing readiness for partial or complete sale to sophisticated capital, now is an excellent time. While the multiples shown below are high, few companies with EBITDA in excess of $1,000,000 will receive offers with these multiples unless they are innovative, proactive, and understand the value added proposition (vis-à-vis that of their competitors) they bring to their clients. For those SMEs who are not ready, preparing for sale to sophisticated capital necessitates an investment-readiness culture…meaning time, effort, and resources. SMEs that “run the business as if they will run it forever, but also run the business as if they will sell it tomorrow, demonstrate a readiness culture.” In preparing specifically for an investment from sophisticated capital, exit options become available such as strategic sales and trade sales to these foresighted SMEs, options which are normally out of reach by many others. Furthermore, when planned for strategically, sophisticated capital can bring much more to the table than simple financial support. PE funds are built on the premise that the investment professionals who run them are skilled at growing the enterprise value of their underlying investments and the proven ability to harvest that value gain on behalf of their investors. They can therefore often bring industry contacts, practical business strategy and insights, analytical support, and many other benefits owing simply to the volume of transactions that they undertake. An alignment between a PE fund and an SME, wherein the business owner takes “some chips off the table” through a partial sale, but remains committed to working with the PE fund for a time, can yield a meaningful second bite of the apple when the PE pursues an eventual exit. 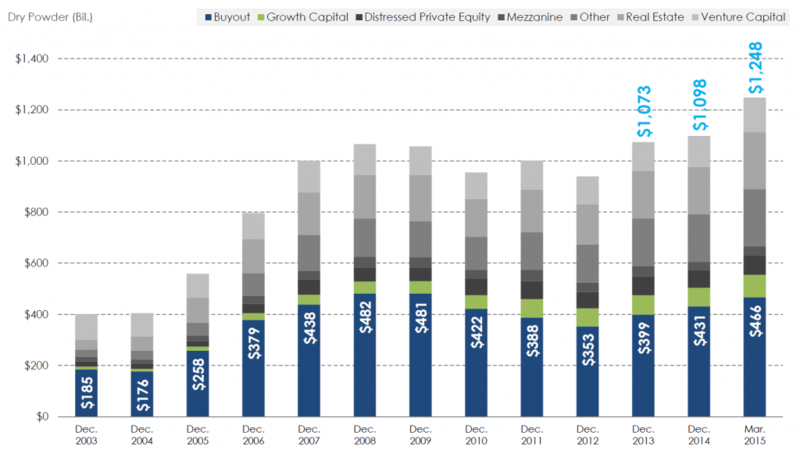 PE funds often have a hold horizon of less than seven years. Sophisticated capital is very picky: not every private business is a suitable investment candidate. As a result of the increase in dry powder, transaction multiples are increasing (above graph). This is a function of the “ready” supply and demand: a greater amount of cash is chasing the same group of investments. But there is a second, big reason for this multiple growth, mentioned earlier. SMEs are, by and large, simply underprepared for sophisticated capital. The SMEs that are prepared are attracting offers at higher valuations and are successfully closing the deal. Those that are underprepared are not attracting offers and, by and large, are not closing. In fact, most funds reject hundreds of SMEs that approach them before they make a single investment. Size: sophisticated capital has to be able to justify the investment it makes in pursuing Due Diligence and making an offer. Businesses that generate more than $5 million annually in sales are instantly more attractive, since they have greater ability to reach return hurdles than smaller businesses. Revenue: some forms of revenue are more desirable than others, businesses which need to make sales continually, every day are less valuable than ones with predictable, recurring revenue. Robust reporting: a key stumbling block for many SMEs—owners are often reluctant to supply financial information to anyone other than their CPA. External investment demands a greater degree of financial transparency than what SMEs are often accustomed to. Systemized: sophisticated capital needs to see that the underlying investment is a well-run business, reliant on systems coupled with talented people. Defined business processes reduce risk and enhance attractiveness. Growth potential: often, a sensible growth strategy suitable for the investment candidate (such as pursuing additional geographical markets or products/services) will be enough to make or break a deal. Many SMEs are deficient in the eyes of sophisticated capital in these and other areas. Making a business a suitable investment candidate often requires time, effort, and resources, but as the multiples show, the investment can be worthwhile. According, to the Exit Planning Institute, about a third of SME owners admit to not knowing all of their exit options, and a further third, can’t be sure. The above graph lays out the broad options available when owners of a business want to reduce their ownership, either partially or completely. Each option has its own dynamics. Preparing a business for partial sale to a High Net Worth Individual requires a type of planning completely different from the planning that goes into creating an Initial Public Offering. 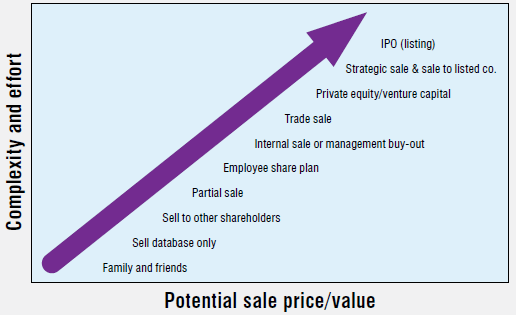 At the lower end, the methods such as selling to other shareholders are less complex and onerous, but also tend to fetch lower multiples than those at the higher end, like sale to PE, where the additional cost of preparation, de-risking of the business, and Due Diligence tends to be reflected in the multiple paid. A partial or complete sale of your SME to sophisticated capital (shown as Private equity/venture capital in this diagram) is just one of the possible exit routes. If an SME owner has a high risk appetite and their exit horizon is more than five years, a strategic sale is worthwhile considering. In my professional experience, owners can succeed adopting a blend of exit strategies. An Employee Share Plan can, for example, pave the way for a management buy-out down the road, and/or serve as a precursor to the internal reporting culture that prevails in publicly listed companies. In short, any efforts made that make a potential transition from the existing owner to a desired owner, (be it sophisticated capital, stock market investors, employees, or anyone else) creates value. This said, a partial or complete sale to PE may not be a suitable exit strategy for the owner(s). But doing some of the basic blocking and tackling required to attract PE may mean you end up with a more desirable business to own anyway. Scott Bulloch is a Partner of Succession Plus’ Las Vegas, NV office. Scott has been an accounting and finance professional for over 20 years, serving in roles at Ernst & Young and Deloitte & Touche and in corporate positions, including Huntsman Corporation and others. He has actively participated as part of management or as an advisor in the valuation and due diligence associated with various business transactions totalling over a billion dollars. Scott can be reached at: sbulloch@successionplus.com.